When I rejoined the single world again, my first thought was, “but I’m 31 and a vegan! Who’s going to want to date me! ?” Considering the last time that I went on dates I was 26 and mostly carnivore, I was pretty sure this was going to be a whole new adventure and I didn’t know what to expect. Those romcoms sure make it seem challenging. First you have to find the guy, then you hate him for a long time (even though you’re secretly attracted to him), and finally something happens and suddenly you like him, kiss to dramatic music and be happily ever after. Credits, insert peppy fun music and possibly some snapshots of your future life. Who has time for all of that? AmIright? So here’s the thing, I was so sure that me saying I was vegan would turn away a good 75% of dates. The reality? Not-a-one. In these past months, not a single dude has really seemed to care. Sometimes there were the protein questions, or the “I could never be vegan” statements, and one particularly charming fellow mimed pulling a sausage out of his pocket, eating it audibly, and asked if it would be weird if he was doing that for real. I’m going to go ahead and say anyone pulling a sausage out of their pocket to eat is weird.. even if it was a vegan sausage. Don’t do that gentlemen. (Did I mention I like goofy guys?) But not one guy seemed even really phased by my veganess. Way to go forward thinking dudes! So the result: Single at 31 and vegan has actually been pretty ridiculously fun! Side note: when you tell your date you cook delicious food: they are totally . Delicious food here we come. It’s officially the season where roasting anything is a great idea. Roasted vegetables = good idea. 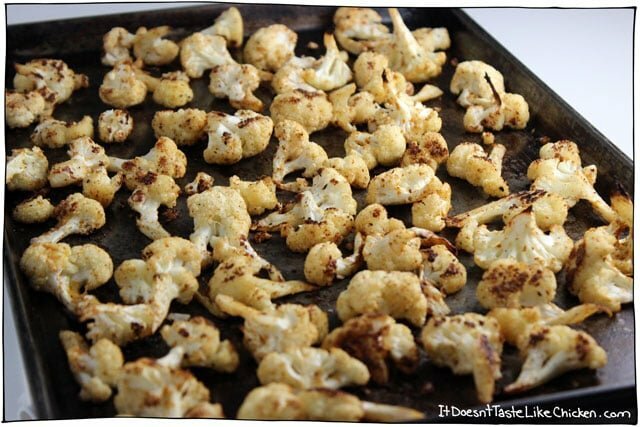 Roasting cauliflower = surprisingly ridiculously good and healthy finger food idea! I would be lying if I said I didn’t polish off this entire sheet of deliciousness all by my self not so long after photographing it. It’s kind of impossible not to. Ok let’s get real, I guess technically this is a side dish kinda food, or you could sprinkle the cauliflower on top of salad, but my most favourite way to eat roasted cauliflower is hot off the pan, dipped into my Creamy Cashew Caesar Salad Dressing, Maple Mustard Dressing, a marinara sauce, or just as is. Yespleasethankyouverymuch. Only 6 ingredients, 30 minutes to make (most of it spent staring in the oven window and drooling), and badda bing, badda boom. Little cauliflower flavour bombs in your mouth. Here we go! 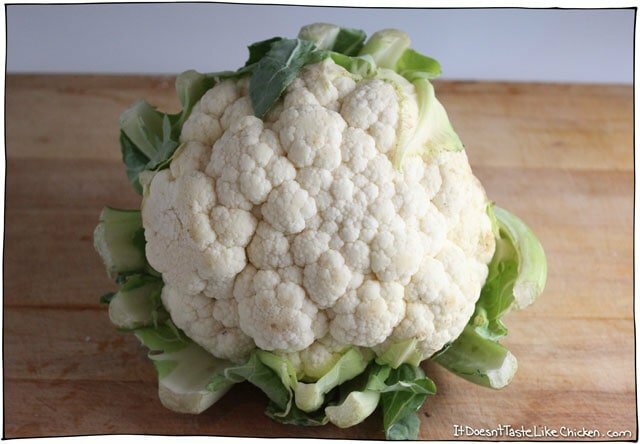 Chop the cauliflower into little florets. Add them to a bowl along with all of the seasonings, and use your hands to toss well to combine. 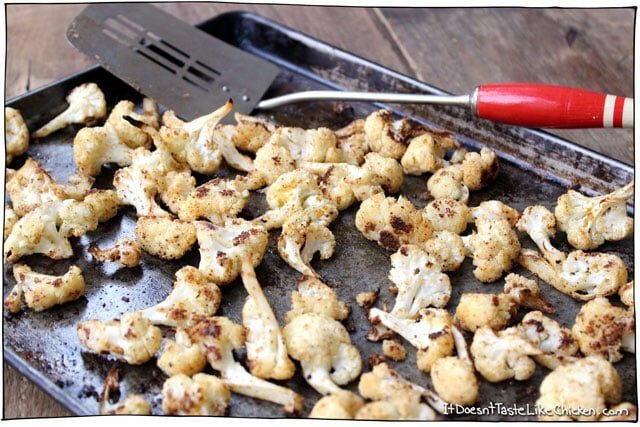 Spread the cauliflower evenly on a baking sheet, and bake for 20 to 25 minutes, flipping once, until everything is browned and tender. Only 6 ingredients, 30 minutes to make (most of it spent staring in the oven window and drooling), and badda bing, badda boom. Little cauliflower flavour bombs in your mouth. So delicious and easy! Add the cauliflower with all of the seasonings to a large bowl and toss well to combine and to evenly coat the cauliflower. 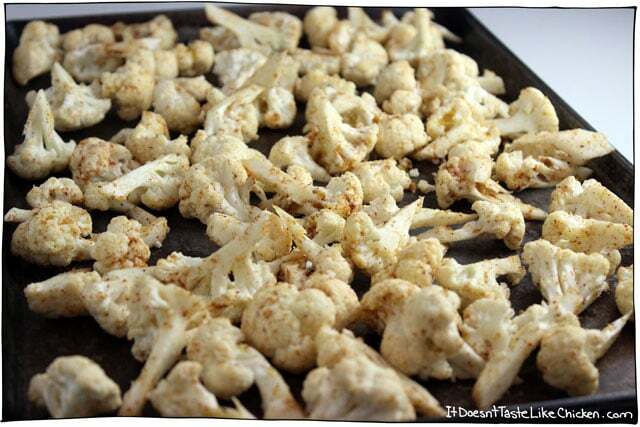 Spread the cauliflower evenly on a baking sheet and bake 25 minutes, flipping once half way through. The cauliflower is done when it is browned and tender. Sever as a side, on top of salad, or eat straight as it is as a snack. Great hot or cold! Hahaha. Has Adam read this post. Very interesting story. I had some cauliflower I needed to use up and decided to try this while my husband and daughters were out of the house. I planned to have them try it when they got home to see if they liked it… I ate it ALL. haha. Maybe they can try it next time. 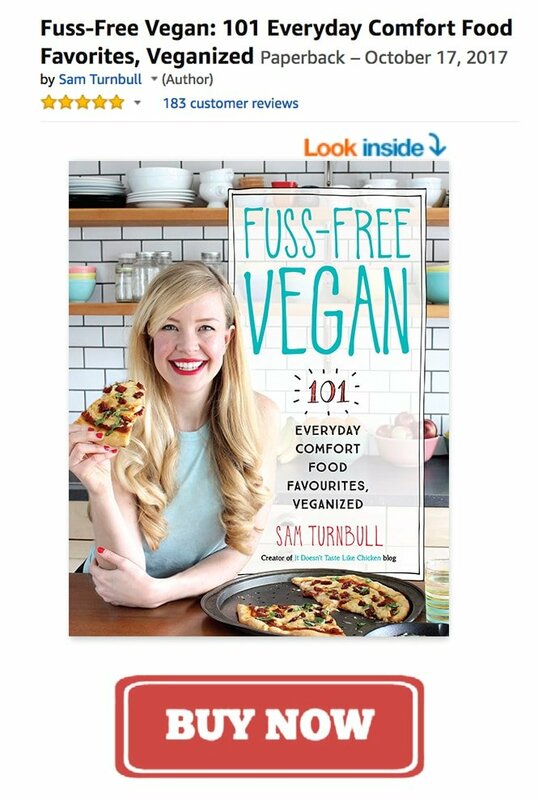 Stick with it, Sam – you’re amazing! This is amazing! 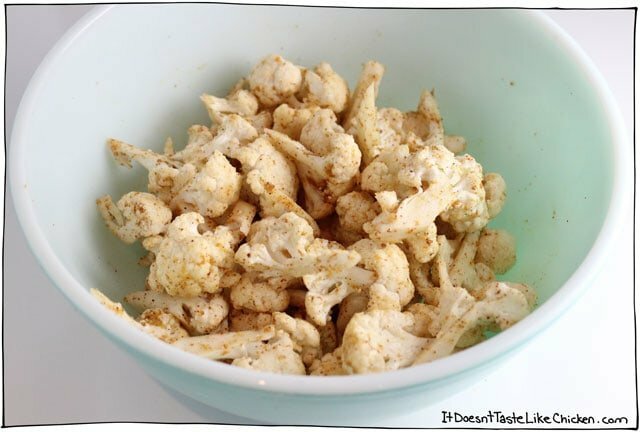 I have eaten my fair share of roasted cauliflower but this is the best! I halved the oil and roasted it a little longer and it was still phenomenal! Thank you!! Thanks for the tip about halving the oil and cooking longer – we’re trying to cut out as much oil as possible. Aww that’s awesome!! So happy you loved it so much Liz! My husband and I ate roasted cauliflower for awhile at Happy Hour to stave of our Trader Joe’s chip addiction. We should get back to this delicious snack! Thank you! Aww you’re welcome Kathy! Definitely a healthier option than chips, but I so so good. Super yum Sam! I said this on Instagram too (wait, that feels very stalkerish…I’m obsessed with you but only in an “I’m so impressed with your recipes and posts and can’t wait for more” sort of way ). Anyway, I never think about having cauliflower. I have no idea why. It’s a neglected vegetable at my house. Not anymore! Aww thanks Heather. Yeah, it’s kind of a forgotten about vegetable, but it can be so scrumptious!! I hope you enjoy the recipe! A tip for lazy vegans: we could throw all the ingredients into a plastic bag and give it a good shake to coat the cauliflower evenly, leave it in the fridge to “marinate” a while, then tip the contents onto the baking sheet to cook. Now, if only I could find a lazy way to flip them. In terms of the marriage thing – there’s no one right answer. I bet there are all sorts of variations on this theme in married couples out there. For me, I was non-dairy vegetarian when I met my husband. He was not veg but had stopped eating red meat for health reasons. I never asked him to change but made it clear that I could not cook meat so if he wanted it, he would have to cook it. Over time, he discovered I am a much better cook than he and he came to his own conclusions after reading and having discussions and decided to go veg, is non-dairy for the most part (if we are out he might have some whereas I cannot as I have a bad reaction in addition to knowing it is not good for me) because I am and don’t buy it and then he decided to give up eggs most of the time. So all in all, I ended up with a veggie husband who chose it of his own accord so he wouldn’t feel bullied into it and thus is that much happier. We now have a 3 year old vegetarian, non-dairy son who is very healthy and a 2nd baby on the way. My big message is both of you have to decide what’s a deal-breaker for you and what you can live with – and then know that these things might change over time. Sometimes compromises are good for everyone and leave you with the best person overall and other times some things can’t be compromised on. You have to fill in the details. 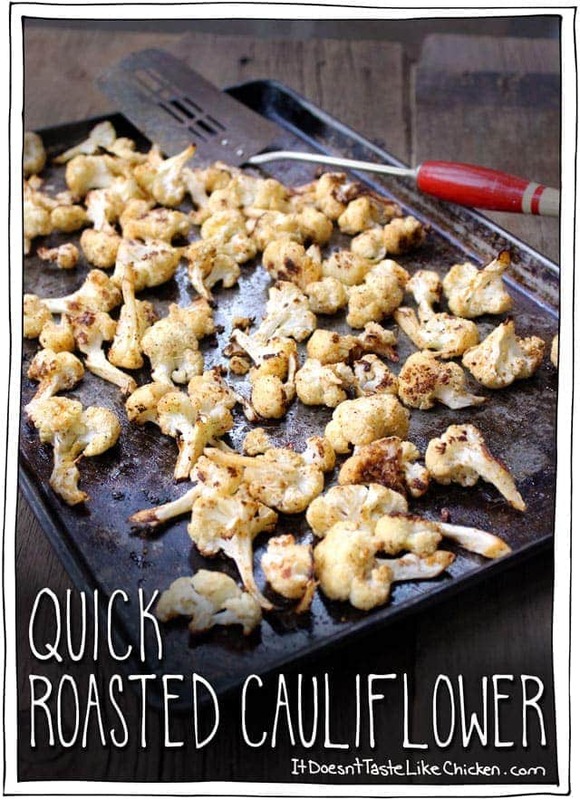 EVERYONE (vegan or not) loves roasted cauliflower! How could they not?! Just curious, how do you feel about possibly marrying a non-vegan? My boyfriend and I have been talking about it a lot; obviously it’s not something we would break up over, but I’m just not sure how to handle that. Would he just cook meat at home and I’ll cook everything else and he can add to his meal if he wants? What about kids? Ugh, I guess I’m still pretty young to be thinking about that lol just wondering your thoughts! I know right? 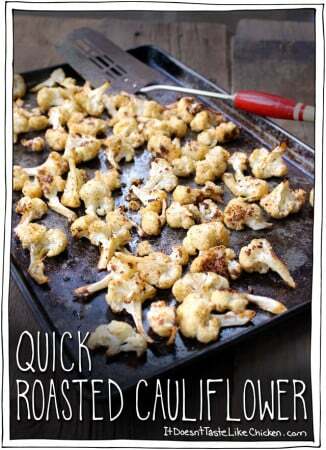 Roasted cauliflower for the win. Are you proposing to me? Hahaha. Jokes. Umm… marrying a meat eater… You know I don’t think I can make a statement one way or the other. Obviously it would be amazing if future husband was vegan, but I think each relationship and the circumstances that surround it would be unique. I’m not for or against it, it’s more about the individual for me. That said, I can be pretty bossy sometimes, I can’t imagine having meat in my fridge, so maybe it would be if he wanted to eat it meat, he could go to a restaurant kinda thing. Not in the house. I know that’s how it was in my last relationship, and that seemed to work just fine.